This is the first post in a series about my first experience with competition barbecue. This summer I helped my brother at a barbecue competition in Indianapolis, Indiana. While it is a little overdue, I will be posting about the experience over the next few weeks. While the weather is getting cool here in the northeast, things will get a little smoky here on the blog! My brother Marc is a fantastic cook - he has been since we were little. I've mentioned it before on the blog. We used to make ourselves after school snacks and dinners when are parents were busy. Except that one time he almost caught the microwave on fire, we did pretty well! Throughout college and now into being a grown-up, he has continued to expand his culinary horizons. This summer I joined him for a weekend in Indianapolis to pursue his delicious new hobby of competition barbecue. Competition Eve - getting ready for the night ahead. What is competition barbecue? Simply explained, teams gather to barbecue (smoke) meat for prize money and bragging rights. In reality, custom smokers are commissioned, secret spice rubs and sauces are developed, entire kitchens and bedrooms are packed up into trailers, and teams spend the weekend working hard at their craft. After a few seasons of backyard smoking, my brother gifted himself a custom smoker for his big birthday this year. Depending on who you ask, the smoker is either St. Louis Cardinals Red or Hoosier Red (we're from St. Louis and Marc is an Indiana University alumni). The smoker was custom built by Iron Hog BBQ of Kansas City. Saturday morning - competition day. 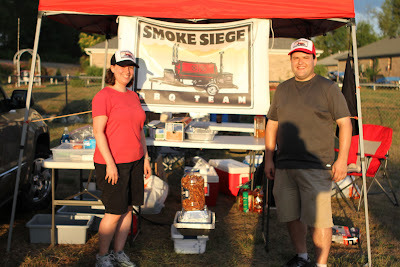 I flew out to Indianapolis to join the Smoke Siege BBQ Team for its second competition this summer. Our destination was New Palestine, Indiana for the "Wine, Brew & Bar-B-Que, Too" event. There are a few different competition circuits and formats. This event was a Kansas City Barbecue Society event, following rules determined by the society. For this event, 50 teams were competing for prizes in the following categories: chicken, ribs, pork, and brisket. Teams could also turn in a sauce as well as participate in a People's Choice pulled pork (festival attendees paid $5 to taste and vote for the best pulled pork). We entered all categories including sauce. Teams are provided with turn-in boxes for each category. You are judged on taste, tenderness and appearance. Appearance involves someone on the team spending a lot of time arranging curly parsley into a fluffy bed for the meat. All of the work has to be done on-site. Judging is blind, done by a panel of six KCBS certified judges (they take an oath). Points are awarded by each judge, the highest and lowest scores are tossed, and your final score is tallied. At this competition, teams were competing for a total of $11,000 in prize money across the categories. There are category winners as well as an overall competition winner. Plush parsley prepared for presentation - thanks to Rob and Steve..
Marc had some help prepping before my arrival. The rules allow trimming and cleaning of meat before arriving on site. His friend Alan spent a few hours expertly preparing the skin on the chicken thighs and Marc trimmed the excess fat from the pork and brisket. On Friday morning, we got up early to finish blending the sauces and rubs before loading up the car and heading out. A lot of organization is required for these competitions. You don't want to take everything, but you don't want to be without something crucial to your success. It seemed like we took everything but the kitchen sink (although many teams did take sinks!). After stocking up on a few last minute supplies like water and beer we headed East to the "New Pal" Lions Club parking lot. Teams came from all over Indiana to compete. There were a few from Michigan and even one from Mississippi! Competition barbecue is a serious hobby and even a profession for some. Teams included hobbyists like us, lifelong barbecue aficionados, and even barbecue restaurants. Team names ran from the pretty basic to the more entertaining. Names like Rob-a-cue (staffed by a very nice man name Rob), Sweet Racks and Smokin' Butts, Squealers BBQ, and the aptly named team below. A lot of tongue-in-cheek names to be found. Set-ups ranged from tents and trailers to RVs and bigger RVs and tricked out buses. That's the range you get in the types of teams - but bigger equipment doesn't necessarily translate to better barbecue. The other side had 2 giant televisions. After we pulled into the Lions Club lot on Friday afternoon we got to work setting up our spot for the weekend. We had the car, the smoker, and a pop-up tent. Marc and I worked on our own for Friday and overnight and then were joined by the rest of the team on Saturday morning. Rob and Steve showed up with the sun to start the parsley prepping and Alan and his dad joined a little later. I'll end this post with a look at our set-up. The Lion's Club provided a water hookup, electricity, and ice. We were on our own for the rest of our supplies for prepping, cooking, presenting and cleaning. Setting up work tables and supplies. Dish washing station - soap, bleach water, and fresh water. Getting the meat inspected so we can start working. done ahead of the competition. Unloading the supplies we transported in the smoker. A look at some of the other team setups. Lions Club lot filled with trucks and tents. Stay tuned for the next post - prep work, a soaking thunderstorm, the cook's meeting, and cook's dinner. Our third teammate on Friday. BBQ equipment can be an essential utensils to complete your BBQ party.